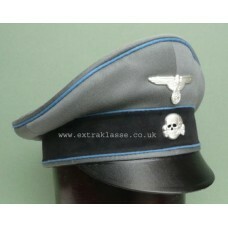 Waffen-SS Reconnaissance / Cavalry Enlisted & NCO ranks 'Old Style' field service cap. 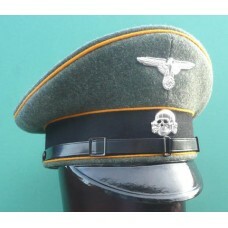 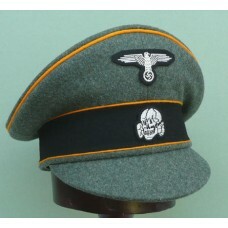 'Crusher'..
Peaked cap for Waffen-SS Reconnaissance / Cavalry, enlisted & NCO ranks. 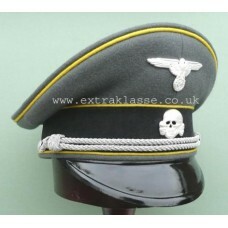 Field grey felted..
Waffen-SS Signal Officers Peaked Cap with 'Doeskin' top, Lemon yellow piping, aluminium chin cord &a..
Waffen-SS Transport Officers old style field service cap, with grey tricot top & light blue pipi..